In the early 1960s people were generally unconcerned about lower cholesterol. However, with heart disease taking an alarming toll on people the cholesterol and heart disease connection became a real topic of concern. The latest research has shown that across the board lower cholesterol readings are appearing in Americans of all ages, but especially in older Americans. Research conducted between 1960 and 2002 indicates that average cholesterol levels have lowered. For men and women together ages 20 to 74, LDL cholesterol was significantly lower. Total cholesterol dropped from 222 milligrams per deciliter of blood to 203 mg/dL. The greatest drop was seen in those over the age of 50. Older Americans between the age of 60 and 74 saw a 12 percent drop in men’s cholesterol levels (from 232 to 204) and a 15 percent drop in women’s (down from 263 to 223). Much of the drop is credited to the introduction of a class of drugs known as statins. Statin drugs, sold under such brands as Lipitor, Zocor, and Pravachol, were introduced in the late 1980s. They focus on lowering the Low Density Lipoprotein (LDL) cholesterol. Total cholesterol levels are considered good if the reading falls below 200 mg/dL. LDL cholesterol alone should be below 100 mg/dL. Although the statin drugs can dramatically help in lowering cholesterol, they do not come without the risk of side effects, some of them very serious. If you experience muscle weakness or soreness while taking a statin drug, it could be a sign of kidney failure and should be reported immediately to a doctor. Also, once prescribed a statin drug for lowering cholesterol, you will probably need to take it for life. 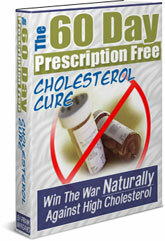 There are risk free, safe and especially effective ways for lowering cholesterol without taking statin drugs. A diet containing specific nutrients can help in lowering LDL cholesterol significantly without side effects. To learn all about the natural way for lowering cholesterol, get your copy of The 60-Day Prescription Free Cholesterol Cure by Frank Mangano.